When Dindin was barely two years old, we discovered some great finds at our store’s warehouse–Polly Pocket Tiny World toys–the original ones made by Bluebird. The dolls came in different settings like cottage, pizza house, and cafe and they are dressed based on the theme. But there was one thing–the dolls are just about an inch tall and soooo tiny. We tried opening one pack and Dindin liked it. She played with the tiny dolls and not one did she put them in her mouth (remember she was just a toddler at that time). After playing we diligently counted the dolls to make sure they were complete. Months would pass and we would open another set. Right now, Dindin has five sets of Polly Pocket Tiny World, which consists of five houses and 14 dolls. So we have to check their attendance each night before tucking them in. But that is how we take care of her toys. Polly’s Country House. Dindin’s first set comes with four dolls in a party mood. Attic opens up to reveal a bedroom. Polly’s Pizza Place. 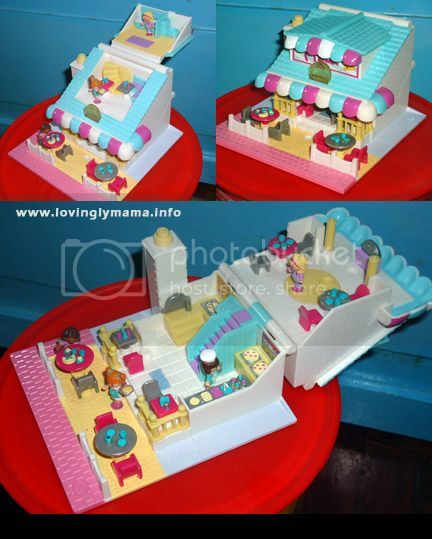 Dindin’s second Polly Pocket set is this pizza house with four dolls who are either eating or serving. Polly’s Pet Shop. This third set only comes with 2 dolls who are manning a pet shop. Polly’s Cosy Cottage. Dindin’s fourth set has two dolls that are in pajamas–ready to sleep in their cozy little cot. Polly’s Beach Cafe. The latest set has two dolls. It is a beach cafe complete with two lounging chairs in front. Below you will find how we keep these Tiny World sets together. We looked for a rectangular container that is quite big but not too deep. We turned it upside down and used the cover as the “ground”. Then we positioned the sets. We used the container as the cover so that we can put it on at night to protect it from dust and so that we can easily lift it when she wants to play with them. This one was taken three sets ago and so our community is getting crowded by now. If I can’t complete the sets, I would love to have the Polly’s Village School and the Polly’s Village Church for our collection! Wow! 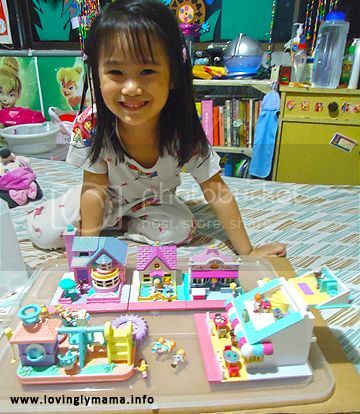 I love Polly Pockets 🙂 Kaya lang di ako pwede bumili kasi puro boys mga anak ko. Your little girl is so lucky to have all those toys. I couldn’t afford to buy expensive toys and most of my kids’ toys came from ninangs. Glad they’re grown up now, they don’t ask for toys but shop for bags and other girly stuff..
Dindin is so pretty, love those smiles, so cute! Cute toys for little girls. i love the village collection.. I just remember childhood days.. Your daughter’s toys look very well-taken cared of. It’s nice to provide toys to children who know how to take care of their things. wow! those Polly Pocket toys look adorable and expensive. May I know how much for each set, mommy? Way back my childhood, I envy those kids who have Polly Pocket. I even remember the Polly Pocket’s brief commercial whenever I watch Nickelodeon channel. Oh those where the days, I hope you can complete the set…it’s indeed a great collection. My niece loves Polly pocket, I also love how you can change her clothes and there are so many things she can play and interact with. I like your baby smile.Really she is enjoying a lot with these attractive and expensive toys.May god bless your sweet baby.